For the record, I'm a person who can watch almost anything and find some germ of a good idea in it. I'm the friend that will watch a "horrible" series or a "terrible" movie just because it exists. I was exposed to tons of c-level films as well as the great pieces of nerdy cinema as a kid growing up in the 1980s through the 1990s. I have fond memories of The Garbage Pail Kids and can see the merits of certain Drop Dead Fred scenes. I'm that guy so trust me when I say that a movie is bad but I can see the positive in it. 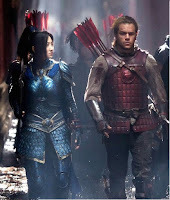 The Great Wall is not a great movie but it is not as bad as most people would think. And that opinion has nothing at all to do with plot reasons. The Great Wall was released to great derision. There was one major issue that I'm only going to get into marginally here (I hope) but I want to give you my actual opinion on this film as a viewer trying to leave my preconceived notions of it out of the movie as I watched. I always hear his name in my head like they say it in Team America. Alright, I was going to try to avoid it but since I want to get to what I want to talk about let's discuss the elephant in the room. The movie is mainly about an European mercenary played by Matt Damon who is traveling to the Far East to search for gunpowder during the time of the Song Dynasty. On his way to China, he loses men and is ultimately attacked by a creature that he kills alone. 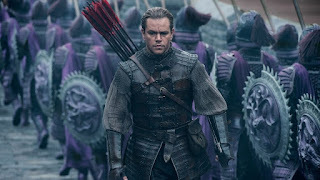 Damon and his last remaining cohort make it to the Great Wall when they are chased down by Khitan bandits. At the Wall, they learn the truth about the monsters called the Tao Tei and the group created to fight them, the color coded warriors of the Nameless Order. Damon reevaluates his mercenary ways and eventually joins the Nameless Order in their fight against the Tao Tei. The plot is predictable as hell. You know immediately that Damon would ultimately reveal his good inner core despite all the protestations to the contrary he makes. This is especially clear when we are introduced to the attractive leader of the blue colored Crane Troops. I also knew that Damon having killed a monster by himself would somehow have the key to their defeat and survive to win the day in the final battle. It is a bit of a White Savior arc but, mostly, as one member of my favorite late night duo would say, "It's just Hollywood, baby." They casted Damon in the lead role to attract a larger audience and make it more palatable to certain audiences which worked about as well as that same plan they pursued with the live action Ghost In The Shell. 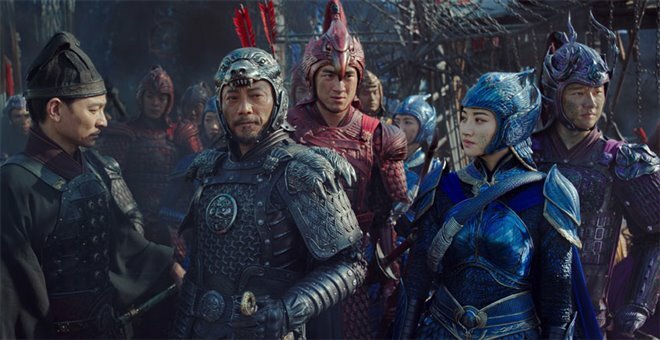 So, The Great Wall is a very basic movie if we just looked at it for a story. On the other hand, The Great Wall is a FANTASTIC visual movie. 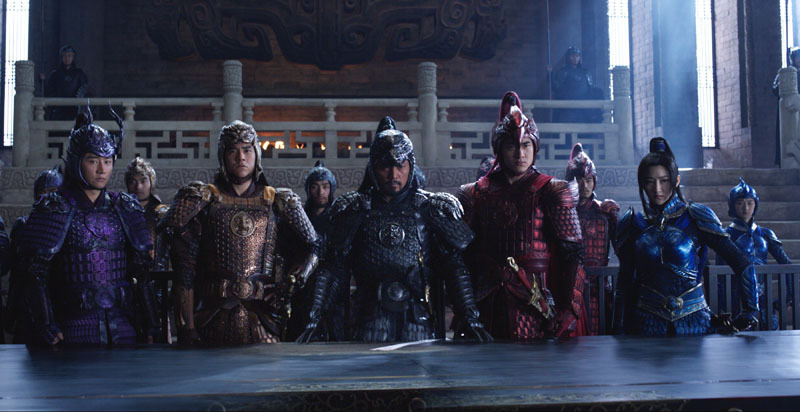 The film's director is Zhang Yimou, who was also the director of the movies Hero and House of Flying Daggers. He brings a Chinese cinematic eye to this film and it is evident in the action and overall look of this film. The look of the whole movie is why I give this movie a pass. This is mostly due to the work of the costume designer a Mexican woman named Mayes Rubeo, who also worked on the visually stunning movie Avatar (another film that could be argued for its handling of a white guy encountering and saving an indigenous population but I'll let that rest). The Nameless Order is an ancient group of warriors who specialize in different attack modes to fight the alien swarm of the Tao Tei. They are clad in different armor that quickly identifies them for what role they play in this ongoing struggle. There are the Bear Troop who are in black and are melee fighters. There seems to be less of them but they are strong and their leader leads the whole army. Next we have the Tiger Troop who are in yellow/gold and are in charge of artillery, providing support for the other groups and utilizing the weapons which are hidden inside the wall, including fireballs and large blades. They seem to be more aggressive than the others and this is shown in their leader. There is also the Deer Troop, a purple armored cavalry division but they are meh so we won't talk about them. The final two groups in The Nameless Order are the Crane Troops and the Eagle Troops. These are the most important in the movie mainly because we are shown how awesome the Cranes are almost immediately and Damon character joins the Eagles by the final battle of the film. The Crane Troop are comprised of an entirely female group of soldiers. They all use spears and are dressed in a vibrant blue. The blue is more than an aesthetically pleasing choice- they are blue to camouflage them when they attack. The Cranes jump from the top of the wall with spears and rings attached around their waists. They attack the Tao Tei monsters from above and their armor is harder to discern from the generally blue sky by the monsters. They are the most daring soldiers in the army and the foundation of the amazing feats they try are based in trust. The Eagle Troop are all red fighters who utilize archery. This comes in the form of crossbow attacks ranging from personal handheld weapons to extremely large bows along the top of the wall. Damon's character is already an accomplished archer from his many years of fighting in wars and naturally fits into the Eagles when he decides to step up to fight the monstrous Tao Tei. The aforementioned monstrous Tao Tei's queen. This brings me to the bad guys in this movie, the Tao Tei. 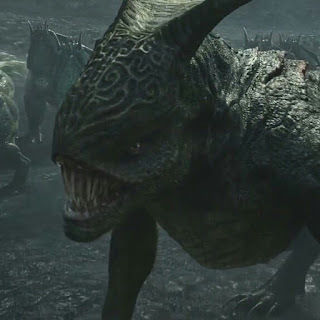 They are a group of alien creatures who arrived when a meteor crashed during the reign of a greedy leader. 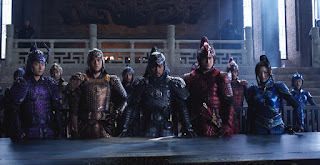 They actually represent greed and gluttony in some record of Chineses myth and definitely do in this film. They have been constantly attacking the Great Wall for centuries at the point we meet them. They swarm and consume and will spread to cover the Earth if not for the forces of The Nameless Order. The Tao Tei are one of the "four evil creatures of the world" in Chinese mythology but not a great deal is known about those origins. The filmmakers took the basic design shared by all the Tao Tei from old masks and vessels that they found that mention Tao Tei. 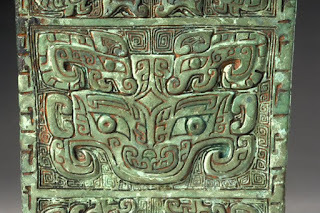 This is usually in the form of masks, like the giant one that is in the banquet hall of The Nameless Order. The design of this ancient evil force is usually that of a face with intricate swirls and markings. The eyes and mouths are identifiable but nothing much more than that. They use elements of this original look as the motif for the markings of the movie's Tao Tei aliens that is seen on their heads. This gives them a look that made me remember hours of playing Shadow Of The Colossus on PlayStation 2. I'm sure the color of the alien menace was a deliberate choice. 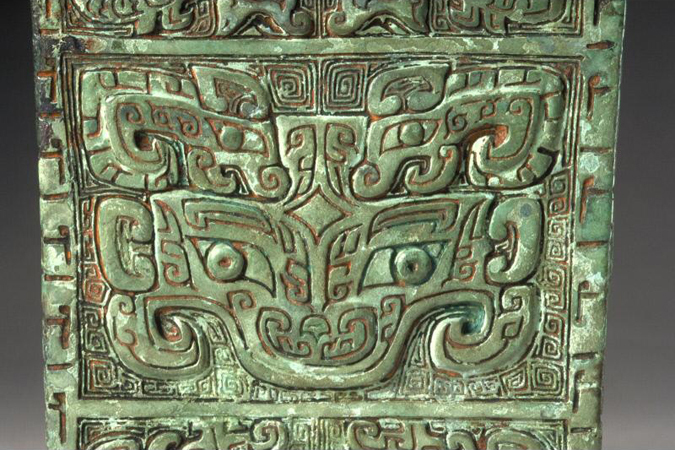 Besides the fact that green has long been associated with aliens (little green men), the Tao Tei coloring evoke connections to jade and greed. Their all green coloring is also in contrast with the warriors of The Nameless Order and is used pretty well to show contrast in their final battle in the Imperial City, where the surround structures are mostly gold and red. The fact that Damon and Jing Tian's characters jump out of a golden tower with multicolored stain glass windows to defeat the Tao Tei queen and her swarm is also not lost on me. I could go on and on about the green element of nature or go in depth on the depictions of the three different types of Tao Tei and their communication abilities but all that needs to be understood is that their was serious thought that went into their design. Ask me about it at a bar if you want. The Great Wall was not a complicated movie to watch. On the surface, the story is pretty simple and generic- an outsider discovers himself by allying himself with warriors of the tribe of a different culture and he earns their respect and his own self-respect in the process. It's been done. The trick about enjoying this movie is appreciating the visual greatness it has in it and the thought process that went behind the design elements within, particularly the use of color throughout. The Great Wall wasn't a great movie but it was great to watch.